The society is sad to record the news that Christopher Harold, long term member and patron of the society has died aged 92. He was still attending society meetings prior to our summer break. He spoke to us a number of times about heraldry and other topics. Christopher was well known as a local historian and author. He wrote many articles for Panorama as well as the best-seller, 'The Story of St Clement's', the church at West Thurrock which featured in the popular film 'Four Weddings and a Funeral'. An expert on Heraldry, contributed the 'County of Essex' to the series 'Hatchments in Britain'. He is the author of 'Exploring Thurrock', a historical guide to Thurrock. 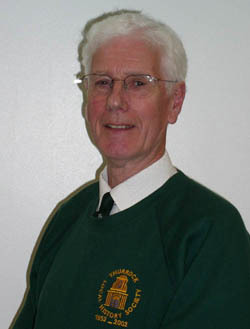 A chess and music lover and member of Thurrock Arts Council since 1969, he held the post of Chairman for ten years. His coat of arms illustrates his contribution to heraldry and the arts. He will be sorely missed, and our thoughts are with his family.